Forester’s roulette computers all use the traditional roulette computer algorithm, so they all achieve accuracy no better than visual ballistics techniques. Some of his recent models have added features that attempt to predict which diamond the ball will hit, but the approach is inappropriate and still being developed. Roulette computer with audio predictions (speaking computers): his first roulette computer gave the player an electric zap when the ball was above the predicted number. Like his other devices, it used the basic algorithm, but even on wheels that are incredibly easy to beat, it was near impossible to apply for many reasons, including half the time the ball wasn’t even visible in real casino conditions (see full review of FFZ device). He eventually developed his first speaking computer (FFA) which also used the basic algorithm. Predictions anytime in the spin: The most basic computer algorithm can only give a prediction when the ball is at a specific speed. Eventually he designed his FFA-unlimitited which is his first computer that could predict at any ball speed. However, it incorrectly assumes the ball deceleration is linear, which makes accurate predictions impossible for any advanced approaches. Specifically, rather than model the actual ball deceleration curve, he incorrectly assumes the ball deceleration is linear (learn more about linear vs actual ball deceleration). Diamond targeting: Forester’s approaches to diamond targeting are ineffective mainly because there are no adjustments for ball deceleration rate changes that naturally occur over time, and the incorrect assumption that ball deceleration is linear. His latest attempt at diamond targeting is his acrobat device which unfortunately is no different. Adjusting for different ball bounce distance on different rotor speeds: microprocessor roulette computers can only store a very small amount of data, so they are not capable of storing the required information. Additionally, based on data he published about how rotor speed affects ball scatter, he doesn’t appear to understand the relationship between rotor speed and scatter. Specifically he tested two different rotor speed ranges and found both the location of peaks had changed (high bars in scatter chart), and the actual relative size and spread had changed. His solution was a computer that spoke the rotor speed after the predicted number. Then the player needed to write it down (ie 4320ms), and count how far the ball landed from the unadjusted prediction. Then the user needed to see if they can find a linear relationship between the rotor speed and how far the ball seems to bounce. Then in actual play, to make this adjustment, the player needed to get the unadjusted prediction, hear the rotor speed, then manually adjust the number of pockets before actually betting. The entire process is beyond impractical in real casino conditions. My Uber and Hybrid computers automatically save all of the required data, and make the adjustments automatically. The player doesn’t need to write anything down. Additionally, it applies a much more sophisticated and accurate approach to modelling ball scatter on different rotor speeds. I was sent the FFA device for free by players that found my computers more suitable. See the thorough review of the ffa roulette computer at roulettesystemreviews.com. Ultimately it is just like the FFZ, except the actual predictions are spoken to the player via a wireless earpiece. It still uses the same basic algorithms so there is ultimately no difference in accuracy to the FFZ. You will achieve exactly the same accuracy with visual ballistics as it uses exactly the same approach. Miro has published a few videos of this device. To an uneducated player, it looks impressive. But the reality is the ball almost always hits the same diamond, has almost identical timings for the ball revolutions, and the ball barely bounces. Such wheels are incredibly easy to beat, even with simple visual ballistics. You need to understand the basic algorithm section to understand why the results in his videos are easily replicated with visual ballistic techniques – without any electronic device. Predictions anytime (the “unlimited” version): this also assumes the ball deceleration is linear. Read the linear vs actual section so you understand the limitations. i. To better define when one revolution starts and ends. This is intended to reduce the number of peaks in the scatter chart, or rather create clearer peaks in the scatter chart. ii. To avoid spins where the ball does not hit the dominant diamond. Again this is intended to increase peak definition in the scatter chart. The point set feature ultimately was a failure and was changed to a different approach. One of the main reason for this is the algorithm relied on only data from one spin. This is inadequate because firstly there is no guarantee you took accurate timings. And secondly, no two spins are exactly the same. There is always significant variation in ball deceleration rates between different spins. An example is if the ball slightly bumped on a ball track imperfection, which slowed the ball faster than usual. This happens all the time but you can’t realistically see or hear it occur in the casino. As he eventually recognized the above problem, Miro created the “Viper” version. This has exactly the same intentions as “point set”, but it also failed and was eventually changed. The approach was that after each prediction, the computer would announce to the player the actual detected ball speed. This was only possible if the player targeted a specific ball speed window (a key revolution), otherwise the ball speeds would have definitive pattern without much more complex manual analysis. This is extremely difficult in the home environment, let alone the casino environment. * In real casino conditions, various factors affect the ball’s deceleration rate. This means that no matter how many saved timings the user has, predictions will become less accurate over time. Even a slight variation in ball deceleration means the difference between the ball landing in the predicted area, and avoiding it. And if you are avoiding the winning number, you are losing more than you would with random bet selection. This is a major problem affecting all of Miro’s devices, and any other device using the basic roulette computer algorithm. This is Forester’s latest attempt at diamond targeting. For now it is installed on small hardware originally intended to be mouth operated. I developed a mouth-operated computer approximately 6 years ago, but ultimately abandoned development of microprocessor device in favour of modified mobile phones. Rather than it being an independent computer, Acrobat is more an algorithm. It closely resembles the method used by my very first roulette computer – a method that Miro initially criticized, and now implemented himself half a decade later. My latest computers use a much better method, with much higher accuracy, without loss of accuracy when ball deceleration rates change, and does it all automatically. The acrobat gets is name from its ability to use different jump values for when different diamonds are hit. Again, my very first roulette computer is capable of this. To use acrobat, the player needs to take 5 or so ball samples and specify which diamond the ball hit. Soon he will find much more is needed for proper definition. But for now, let’s assume it only takes 5 spins. This needs to be done for each direction because the ball does not behave the same in both directions. So you need 10 spins for your ball sample(s). This will take about 20 minutes. Then finally you are ready to start getting predictions and creating your scatter chart (A,B etc). Then for another 2 or so hours, you need to collect data for your scatter chart. By the time you are done, the ball’s deceleration rate will be significantly different, and your data obsolete. Only a very small difference in a variable like air pressure means the difference between the ball hitting one diamond or another – the difference between winning and losing. That is unless your two dominant diamonds share the same optimal scatter offset, as in Miro’s demo video. * Modern wheel in good condition, with smoother and more subtle ball deceleration: The more rapid the ball deceleration, the greater the difference between ball revolutions, and the easier diamond targeting is. His wheel demonstrates a ball revolution timing difference of 250ms whereas my wheel has a 90ms difference. This makes conditions on my wheel far more difficult and realistic. * Early predictions of diamond hits, NOT diamond hit predictions after the ball has hit the diamond: Miro’s acrobat demo shows diamond hit predictions only after the ball hits the diamond. * Diamond hit predictions WITHOUT very late ball clicks: in Miro’s demo video, the ball clicks continue well after the first prediction is received. This enables his device to more accurately predict the diamond. But getting a diamond hit prediction after the actual predicted number is pointless as data must be used to predict before no more bets is called. While he receives predictions early enough, his clicks usually continue until there about 3-4 ball revolutions remaining. This is very late in the spin. * Conditions where different diamond hits do NOT produce closely matched scatter distance: if the ball bounces the same distance from the untuned prediction regardless of the hit diamond, the wheel will give false positive results. The demonstration of my early diamond targeting feature (see videos page) replicates all of the above conditions. If you apply basic visual ballistics against the same spins in his acrobat demo, you will find the result are easily replicated without any roulette computer. 1. The player takes one ball sample. 2. When the ball falls, the player inputs the winning number and which diamond the ball hit. 3. For each direction independently, the computer automatically determines which ball speed ranges result in the ball hitting specific diamonds. The jump (offset/scatter) data is saved to the computer’s internal chart, and the correct jump value (offset) is automatically calculated for each diamond and each direction. This is demonstrated in the video here: old version diamond targeting (see videos page). The wheel used is modern and in perfect condition. Additionally, the ball deceleration is much more gradual than in Miro’s videos, which makes conditions more than twice as difficult. The ball in my video also bounces in a way consistent with modern wheels. It doesn’t drop straight down without bounce as what happens in Miro’s videos. Again this is just my basic version of diamond targeting. It appears Acrobat is Miro’s attempt to copy my earliest approach to diamond targeting, but is attempting to do so using hardware with limited capabilities. Naturally he promotes the concept as new. * Only one sample to get started – the same data is used for both directions, but it is automatically adjusted for each direction to account for the differences. The data for modelling ball behavior and bounce starts from the 2nd spin. Accuracy gradually improves over time. * The user can opt to automatically have the computer make adjustments, or use a manual algorithm like the earlier version. With the automatic version, the user does NOT need to tell the computer which diamond was hit – the computer automatically learns the offset (jump values) to use, with consideration to adjustments for different ball scatter on different rotor speeds. * Automatic adjustments are made to the computer’s model of the ball’s deceleration. This ensures that as ball deceleration changes occur, the computer maintains the same high accuracy. * For each diamond, the ball will hit the rotor with a different trajectory. This means the different rotor speed will affect ball scatter in a different way for each diamond. The computer automatically adjusts for the variations. * If the computer is initially incorrectly calibrated, once the calibration is corrected, it automatically adjusts all previous data to correspond to the correct parameters. In simpler terms, if the player makes a mistake, they don’t need to repeat spins, and they don’t lose previous data. The ultimate benefit of this is the computer learns the wheel in far less time – no data is wasted. The FFV and FFZ are essentially the same device – the FFV uses vibrations and thje FFZ uses an electric zap. I was sent the FFZ device for free from Miro’s customer because he found my computer to be the better option. See the thorough review of the ffz roulette computer at roulettesystemreviews.com. Ultimately it is the most basic implementation of the basic roulette computer algorithm possible. Although of course Miro will tell you it is the most advanced device available anywhere. To use it, basically you take your initial ball sample. Then on the next spin, you clock the rotor (2 clicks, which is once each time the green zero passes your reference diamond). Then you keep clicking each time the ball passes the same diamond until you receive a small electric zap from the device. When the zap is felt, obsewrve which number is under the ball. This is your initial number (call it “A” as we do with visual ballistics). Now when the ball lands, call this number “B”). Repeat the process for however many spins it takes. This gives you a set of data with numbers like “32,5”. Now create a chart (manually on paper) to show how far the ball is bouncing from the number “A”, exactly as we do with visual ballistics. Assuming you find a single good area (peak) like the one shown left, now you commence actual betting. To bet, repeat the process of clocking the ball and rotor. But when you get the zap, manually adjust the number you observe by however many pockets. Then place your bets. The entire process is near impossible for many reason. For example, the ball and rotor are too fast to observe correctly. Also you don’t exactly have a top view of the wheel like in his demo videos, and in the casino you can only see about half of the wheel. 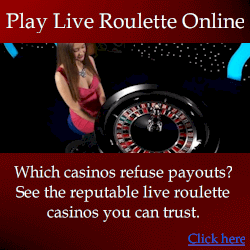 Ultimately the device uses the basic roulette computer algorithm. If you were to write a program for it, it would literally look something like below. PART 2: Is the time interval from part 1 greater than 1000ms? If no, go back to part 1. If yes, give electric zap. THAT’S IT. Rocket science? The best roulette computer money can buy? I offer a free roulette computer (called the “Basic computer”) that does all this, except the reference number (A) is obtained from under the reference diamond which can always be seen, not under the ball which is not visible half the time. It is free to all genuinewinner.com players because it is no comparison to my more advanced devices. One of the first modifications to FFZ was the ability to predict when the ball is at any speed. To achieve this, Miro set FFZ to merely assume the ball deceleration rate is linear. As per the linear vs actual section, this is a very poor shortcut because ball deceleration is never linear. Nevertheless, Miro proclaimed it to be incredibly advanced, surpassing all other roulette computers – neglecting to mention my earliest computer predicted anytime in the spin, and accuraterly modeled the actual deceleration curve with complex polynomials. A later modification he introduced was having the predicted number appear beneath the reference diamond instead of the ball. This was a big step in the right direction, but even my free roulette computer does this. If the device is incapable of beating modern wheels, it doesn’t matter how you use it. Miro has managed to make his FFV about as small as a coin. We achieved this roughly 6 years ago but preferred to focus on mobile phone development. While small computers may seem covert, the fact is if you are physically searched, it will still be found. And it is not easily explained like a mobile phone. Even the phone’s audio equipment can be explained as a simple music player. Ultimately the true measure of a computer being physically undetectable is for it to be easily explained if you are physically searched. There are immense differences between my computers and such devices. I have no intention of revealing details beyond what is on this site as others attempt to copy them. See Steven Hourmouzis resposes to false allegations. To learn more about the differences between all roulette computers, see the roulette computer comparisons chart.